The Economic and Financial Crimes Commission (EFCC) has announced that a recovery N328.9 billion from oil marketers. The commission in a recent statement said its Kano state office recovered the money from nine major oil marketers in twelve months. EFCC said the recovery followed a petition received by the commission from a Law firm B.I Murtala and Co against the management of Nigeria National Petroleum Corporation (NNPC). Also joined in the petition is a subsidiary of NNPC Pipelines and Product Marketing Company (PPMC). The petition, the EFCC said, was written on April 27, 2016. 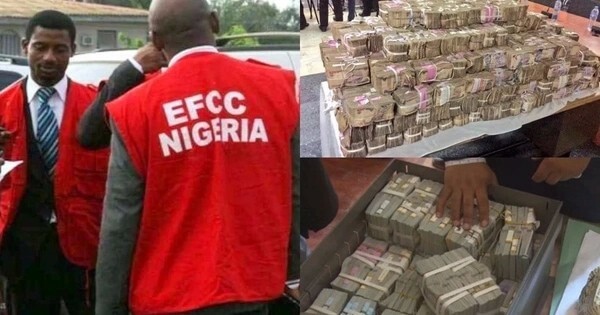 “The Kano operational office of the EFCC has recovered a total sum of N328,988,296,990.62 (Three Hundred and Twenty Eight Billion, Nine Hundred and Eighty Eight Million, Two Hundred and Ninety Six, Nine Hundred and Ninety Naira, Sixty Two Kobo) from nine major oil marketers in twelve months as at July 2017,” the EFCC said in its statement. NAIJ.com earlier reported that the EFCC had declared two oil marketers standing trial at the Lagos High Court in Ikeja wanted. The marketers – Seun Ogunbambo and Habila Theck – were alleged to have been involved in oil subsidy scam. The duo, managing director and general manager of Fargo Petroleum and Gas Limited were facing trial alongside their company.